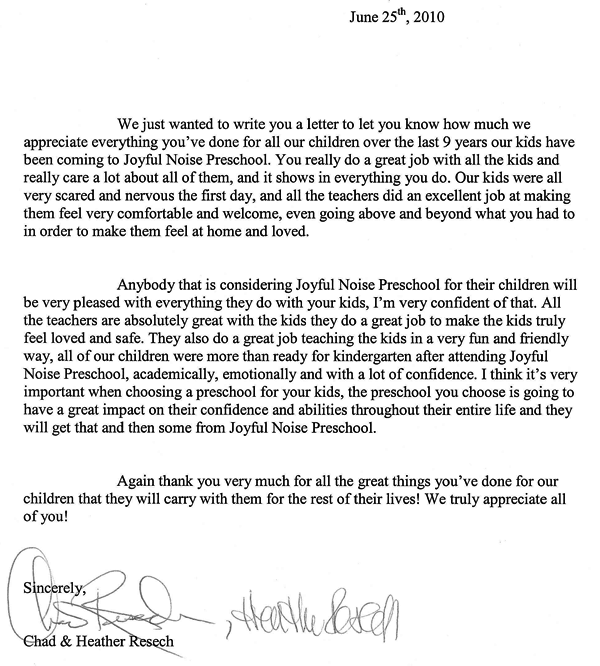 We wanted to thank you from the bottom of our hearts for the exceptional preschool experience you have given our children. 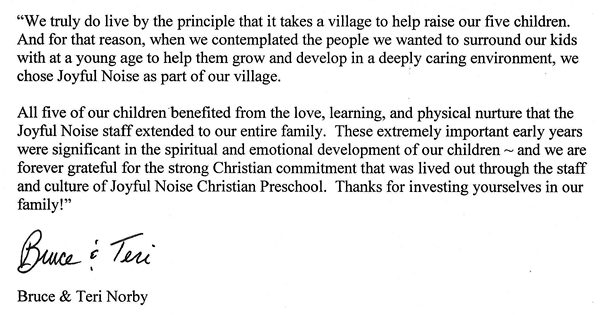 Attending Joyful Noise Preschool has been such a rewarding experience for both of our children. Not only were they ready for kindergarten when they graduated; they were looking forward to it because of the positive first glance of what school is because of you. They walk through life “shining their light for Jesus” and spreading His love thanks to the wonderful encouragement from their teachers at Joyful Noise. Not only did they learn the academic skills they needed for their next stage in life, the social skills they learned were invaluable. They respect others, listen quietly and patiently wait their turn in social environments. I know these skills are a priority in your teaching. We will miss all the ways you have touched our children teaching Gods love over the past 4 years. We know they are better people for attending your program. We cannot thank you enough.